Official Viwawa Blog: Viwawa Sushido Harvest is now a No.1 free app! 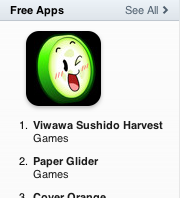 Our new Viwawa Sushido Havest has just reached No.1 Free iPhone® App in the Singapore App Store. We would like to thank all the downloaders, especially our loyal Viwawa gamers for the support. Please stay tuned as we would be updating this game to bring more fun and features! Download this FREE game now, and see how many sushi recipes you can collect!